BHOPAL: Prominent citizens of Bhopal have taken a tough stand against attempts to distort the history of the city. Several voices have emerged against it--ranging from city based historians to activists and political personalities. In a meeting held in Bhopal, it was decided to raise voice and object to the newspaper for publishing a false report. The objection is regarding a news report published in Dainik Bhaskar, a Hindi newspaper, which printed a false story about the foundation of the former princely state of Bhopal. 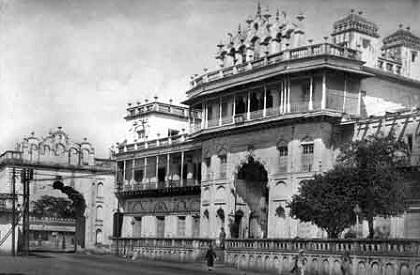 Not only there were factual mistakes, it made wild allegations against the founder of the erstwhile state, Nawab Dost Mohammad Khan, though all historical sources suggest that he treated Rani Kamlapati with great respect. She also treated him as a relative and almost like her son, as he was relatively young then. There are also historical texts that clearly mention that she had tied 'rakhi' on his wrist. And, Dost Mohammad Khan, honoured it by fighting and defeating her enemies. In view of the report, prominent citizens have said that the newspaper published a report without any historical citation and it must apologize to people of Bhopal. Else, there would be a protest and legal action could be taken. CCIM held the meeting. Among those who have raise the voice include Haji Harun, Abdul Wahid Naqvi, Masood Ahmad Khan, Dr Maharul Hasan, Mohammad Mahir, Javed Akhtar, Ismail Beg, Arif Ali Khan, historian Khalid Mohammad, M Kalim Khan et al. Strong voices have emerged from different corners. Activist Mohammed Tarique has said that there are attempts to destroy of ganga-jamuni culture of Bhopal. He is the state chief of Peace India apart from being known for taking up social causes. He said that false stories are being propagated not just about the era when the erstwhile state existed but also about the merger movement. He has contradicted them point-wise and said that the attempts are despicable.